That Red-Dead-like screenshot making the rounds of the internet this week isn't actually of Red Dead Redemption 2, as some had speculated - though the confusion was justified. The image actually depicts Wild West Online, an upcoming MMO that the developers decided to make because Red Dead Redemption never got a PC version. Our pals at GR+ sister site PC Gamer have the full reveal. 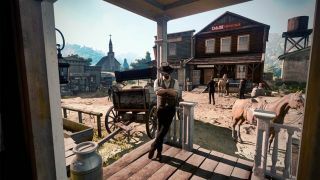 Wild West Online builds on some of the ideas from Red Dead Redemption's online multiplayer mode. Players are free to roam the countryside as gangs of bandits, lone bounty hunters, deputies of the law, or even industrious farmers and miners. It's all built around player collaboration and competition; at the moment, the developers have no plans for combat against NPCs. Wild West Online will hit Kickstarter at the end of this month, though publisher DJ2 says it's just crowdfunding to secure additional features - it hopes to launch the game in fall 2017 either way. That's also when Red Dead Redemption 2 is set to arrive, though Rockstar hasn't confirmed whether it will have a PC version yet. We do know it will host a "brand new online multiplayer experience of its own", and building on the promise of GTA Online sounds mighty promising. Plus, some healthy cowboy competition is always a good thing. Kick up your boots and read through our Red Dead Redemption 2 news roundup to catch up on all the developments, and don't be shy if you missed out on the first game - here's everything you need to know about Red Dead Redemption to get hyped for the sequel.